You’ve been assigned the task to build a web site for an innovative new social networking site called Nose-ster. You’ve decided to take advantage of Liferay Portal and its rapid deployment features as well as its ability to get a fully functional, content-rich web site with integrated social features up and running in little time. Together, we can get you started. 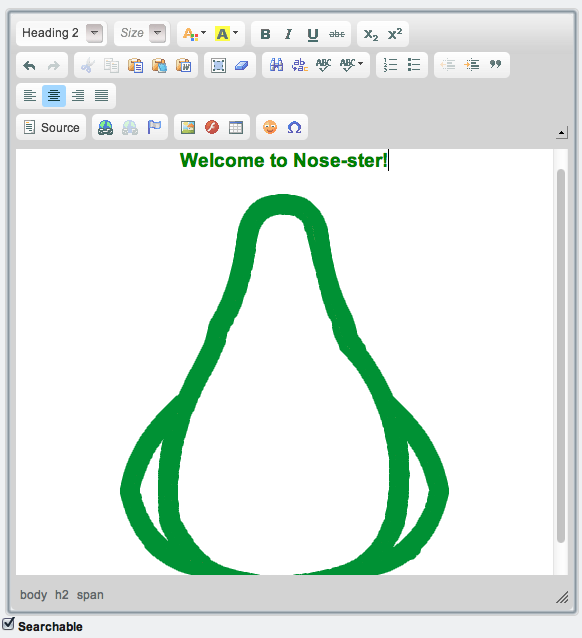 We’ll walk through the creation of Nose-ster’s web site, starting by creating and publishing some simple content using Liferay’s built-in WYSIWYG editor. We’ll then take advantage of Liferay’s robust structure editor. We’ll use templates to display the content and then explore some of the advanced publishing features such as the built-in workflow and Asset Publisher. As we’ve stated above, content is the reason web sites exist. Liferay Portal has made it easier than ever to get content published to your site. Because Liferay Portal is so flexible, you can use basic authoring tools right away or take advantage of the more advanced features. It’s adaptable to your needs. We’ll begin by creating simple content using Liferay’s WYSIWYG Editor and then we’ll publish it to the home page of Nose-ster’s web site. This is a fast and straightforward process that demonstrates how easy it is to create and publish content on your Liferay Portal instance. Let’s learn about the Web Content section of the control panel so we can create and publish our first pieces of content. When you manage web content from the Control Panel you can select the location where the content resides. For instance, you can add content that’s available to a specific site or globally across the portal. The Content section of the Control Panel displays as its heading the name of the site you’re currently working on. This heading is called the context menu selector: you can change the scope of where you’d like to view, edit or create content by using the drop-down selector attached to the heading. 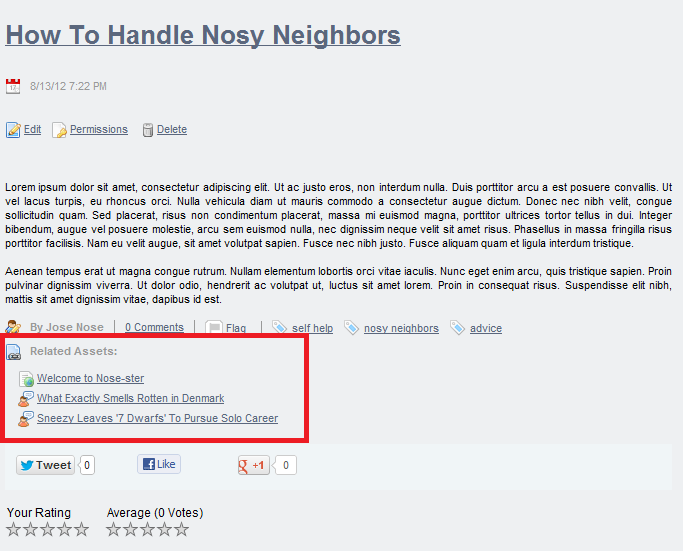 Once you have the Nose-ster site selected, click on the Web Content link in the Control Panel. Next, click the Add button under the Web Content tab. This is a highly customizable form that by default has two fields: a title and a powerful WYSIWYG editor. We could customize this form to contain whatever fields our content needs but let’s keep things simple for now. We’ll cover more advanced features such as structures, templates and content scheduling later in this chapter. 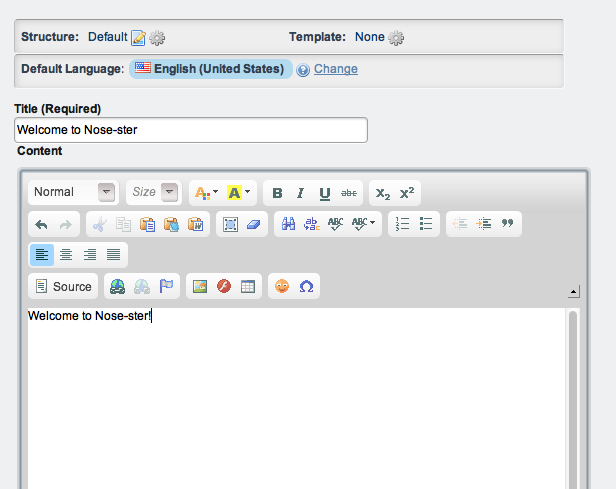 For now, type the words Welcome to Nose-ster in the Name field. Notice that content can be localized in whatever language you want. If you click on the localize checkbox, two select boxes appear which allow you to pick the language you’re working in and the default language. You can enter translations of your content for any language in the list. The screenshot below shows this interface but for now, we won’t be using it, so you can leave it unchecked. In the content field, add a short sentence announcing the web site is up and running. Figure 2.13: The Web Content Editor provides many options for customization. Getting a new web site up and running is an exciting step for anyone, whether it is a large corporation or a small non-profit charity. To celebrate this momentous achievement at Nose-ster, let’s give our announcement some of the pomp and circumstance we think it deserves! Using the editor, select all the text and then change the style to Heading 1 and the color to Dark Green. You could insert an image here or even more text with a different style, as demonstrated in the screenshot below. You can also add bullets, numbering, links to another site or custom images. You can even add an emoticon. Let’s add a smiley face at the end of our announcement. Figure 2.14: View your content changes directly in the editor. The WYSIWYG editor is a flexible tool that gives you the ability to add text, images, tables, links and more. Additionally, you can modify the display to match the purpose of the content. Plus it’s integrated with the rest of Liferay Portal: for example, when you upload an image to be added to a page, that image can be viewed and manipulated in the Documents and Media portlet. If you’re HTML savvy, Liferay WCM doesn’t leave you out in the cold. You can click the Source button and write your own HTML if you wish. On the right of the New Web Content form are options that allow you to customize your web content. Figure 2.15: New web content can be customized in various ways using the menu on the right. Abstract: lets you to create a brief summary of the web content. You can also pair the text with a small image. Categorization: specifies the content type from a list of options. They are Announcements, Blogs, General, News, Press Release, and Test. You can also create tags to make the content easier to find in a search. Note that these categories are defined by a property in the properties file; see the journal.article.types property in chapter 20 for further information. Schedule: customizes the date and time your content publishes and/or expires. Display Page: lets you determine where the web contents are displayed when linked from other pages. The concept of the Canonical URL is new to Liferay 6.1. The Canonical URL is unique for articles that redirect the visitor to the article’s default display page. Imagine you have a newspaper with a sports section and a technology section. You add a Sports page and a Tech page to your site, each one with a specific banner and look and feel. You want the articles to appear in the appropriate pages, but you know in Liferay articles are not related to pages. You can add an article as often as you like in different web content display portlets or in configured Asset Publishers. But if you have a View in context link, where will you show your article? This is where you’d use a default display page. Articles that have a default display page defined are shown with other related articles in the same display page. Imagine you have 100 sports articles and 100 tech articles. In previous versions of Liferay you’d need to create a page for each article to show it. Now with only one sports page and one tech page, you can show all articles in one place in a consistent fashion. There are two ways of creating a display page. You can use a Content Display Page template, which automatically creates everything you need, or you can create one manually. The Content Display Page template is found under Page Templates in the Portal section of the Control Panel. To create a display page manually, add an Asset Publisher to a page. Then make it the Default Asset Publisher for the page. This defines this Asset Publisher as the one that displays the content if several Asset Publishers are on the same page. Set this up by clicking Configuration on your Asset Publisher. Under the Setup tab, navigate to Display Settings and check the checkbox labeled Set as the Default Asset Publisher for This Page. Once you’ve given an article its default display page, links to the article redirect the user to its default display page. To see how this works, add an Asset Publisher to another page, like the Home page of the newspaper, and configure it to View in a Specific Portlet. This setting is found in the Asset Link Behavior menu under Display Settings. If you click on the link, you’ll be redirected to the Default Display Page of the article. This is an example of a canonical URL, and it’s a nice enhancement for Search Engine Optimization (SEO) because the article’s URL becomes the page URL. To a search engine that’s crawling your site, this means that the location of your article never changes. And if you decide to use the content on another page in the future, the article is still available at this URL. This feature is used in search results, in related assets and in Asset Publishers. For more information on Liferay’s Display Pages, see chapter 5. Related Assets: enables you to connect any number of assets within a site or across the portal, even if they don’t share any tags and aren’t in the same category. You can connect your content to a Blogs Entry, Message Boards Message, Web Content, Calendar Event, Bookmarks Entry, Documents and Media Document, and a Wiki Page. Figure 2.16: This blog entry has links to three Related Assets: one web content display and two blog entries. You’ll learn how to publish links to related assets using the Related Assets portlet in the Defining content relationships section of chapter 5. Permissions: customize who has access to the content. By default, content is viewable by Anyone (Guest Role). You can limit viewable permissions by selecting any Role from the drop-down or in the list. Additionally, Liferay Portal provides the ability to customize permissions in more detail. Select the More Options link next to the drop down button and you’ll find the different activities you can grant or deny to your web content. Figure 2.17: Permissions for Web Content allow you to fine-tune how your content is accessed. Custom fields: customize metadata about the web content. The fields can represent anything you like, such as the web content’s author or creation date. If custom fields have been defined for web content (which can be done from the Custom Fields page of the Control Panel), they appear here. For more information on Custom Fields see the Custom Fields section in chapter 16. For this piece of web content, we don’t need to change anything. After you’re finished with permissions, click Save as Draft. This saves the content in draft form. Once you’re satisfied with your changes, select Publish. This makes the content available for display, but we still have some work to do to enable users to see it. In Liferay WCM, all content resides in a container, which is one of two portlets: Web Content Display or Web Content List. By far the most frequently used is the Web Content Display portlet. Let’s look at how it works.